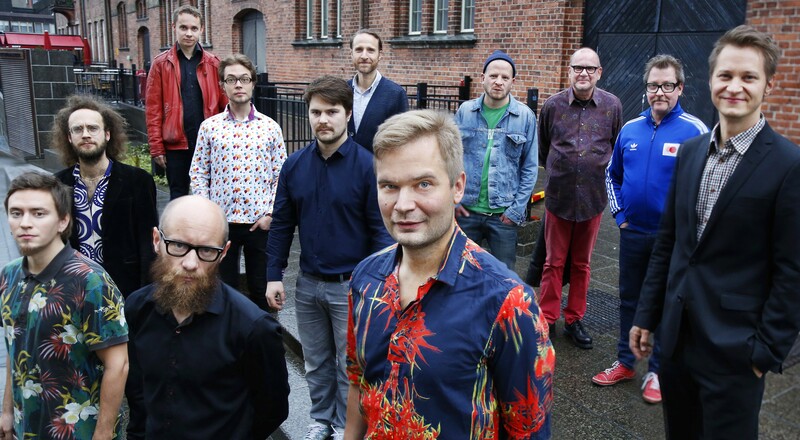 There are plenty of big bands playing at the Moers Festival this year, but the Finnish saxophonist Mikko Innanen almost attains such full size with his 10+ ensemble, which in actuality hits the 12 mark in its membership. Nevertheless, despite being a touch smaller than a traditional big band, this aggregation certainly wields immense power, as witnessed during their set at last November’s Tampere Jazz Happening in Finland. Innanen sculpts terse staccato statements, pierced out by the heavy horn front line, setting one of his own solos up for maximum freedom within this nest of organisation, flicking an eye to his bandmates, cue-ing a flurry of group improvisation. He balances dangerously between marshalled composition and uncaged freak-outs, always pulling back towards an ultimate structure. Next, there might be a sparser interlude, devoted to the rhythm section, in the old-timey sense, Innanen switching from alto to baritone, gliding out a warmer ballad seduction. Then, the crew could deliver a modernised vision of a New Orleans procession, full of jolly charm, only to be splintered apart by a ripping free-form incursion. Innanen is intent on including all eras of jazz, sometimes in a single composition, but always ringing out with his own personalised writing tone. The Moers appearance on Sunday night of the festival will be the third recent gig by 10+, following Tampere and Norway’s Vossa Jazz in March. “We’ll be playing pretty much the same program,” says Innanen. “But In Moers we have to fit everything in to a set of 50 minutes instead of 60 or 70, which makes it a little challenging. I probably have to leave out one or two compositions. Although it’s a shorter concert the music should breathe and have its natural course. It takes a while to write new material for a large band like this, and to make it work, so there’s no need to change it yet”. The first 10+ gig was in November 2012 at Helsinki’s Koko Jazz Club. “It’s a great Finnish venue, loved by many musicians for its great programming and atmosphere. It was rather easy to select the musicians for the band. I had worked with everyone before in various formations and knew they would fit the music I had in mind. The group is almost like Noah’s Ark. Except for the pianist Seppo Kantonen and myself, there’s two of everything”. So, we have trumpeters Verneri Pohjola and Jukka Eskola, trombonists Jari Hongisto and Juho Viljanen, tenor saxophonists Jussi Kannaste and Pauli Lyytinen, and more unusually, bassists Ville Herrala and Eero Tikkanen and drummers Mika Kallio and Joonas Riippa. As the names sound, all of the membership is drawn from the Finnish scene. Still wired following their Tampere appearance, the ensemble went in to the studio to record a 10+ album for the mighty Finnish label TUM, set for release later this year. Gigs by the 10+ are quite rare: they have a booking at the Korpo Sea Jazz Festival, set in the Finnish archipelago, where Innanen is the event’s 2015 artistic director, and that’s their entire datesheet for the rest of this year. The leader admits that it’s quite a trial to get bookings for a 12-piece ensemble nowadays, but has hopes for further ventures in 2016, particularly in the wake of the album’s release.